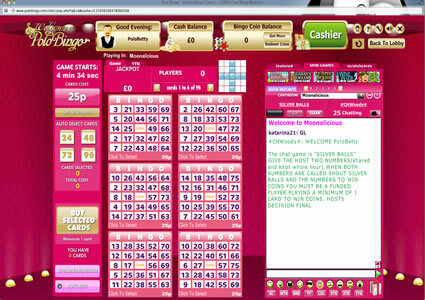 Polo Bingo opened their virtual doors in July of 2010 and they are a standalone site running on the 888holdings/Globalcom software. You would think with a name such as Polo Bingo they would have some association to the sport but there seems to be no correlation between the two and the only time we have ever seen a link between the name anything polo related was when they launched their very first promotion and gave away a Volkswagen Polo! 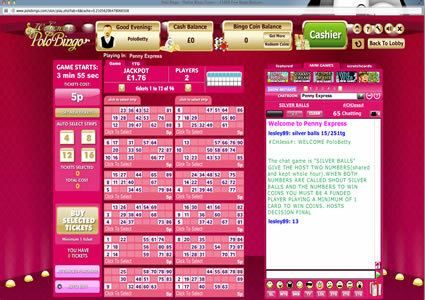 The home page of Polo Bingo is predominantly pink and gold so unlikely to appeal to male players. It very much has the look of a cabaret club and not a very high class one unfortunately. The top of the page is made up of a series of banners advertising their latest offers and promotions and down the left hand side of the screen you will find quick links to all of the important areas of the site and their social networking pages. At the bottom of the page is a lot of information about the site but it is all self promotion blurb really and just repeats the information already printed on their pages. When you come to register, you will find it is a simple process that requires you to enter the usual details including name, address and email address. You will also need to come up with a username, but this should be easy enough as Polo Bingo is not part of a network. Once you have clicked on the ‘Submit Registration’ button at the bottom of the form you will be taken to a second page where you can make a deposit if you so choose. This is not obligatory but to be honest there is not a lot to do unless you are a funded player, so you might as well enter your credit card detail and take advantage of their welcome package. The lobby itself is designed to look more like a Vegas casino and it makes a real change to find a site that does not stick to the software’s standard layout, so we applaud them for that. The lobby is split into two sections with the top one concentrating on their instant games which include Slots, Progressives, Las Vegas and Scratchies (scratchcards). Under this you will find a section dedication to bingo with tabs for 75 ball, 90 ball, jackpots and free zone. All of these tabs will bring up a number of different rooms for you to choose from. The rooms themselves will look very familiar if you have used the 888holdings/Globalcom software before. The good news is everything works well as it has been honed to perfection over many years and across literally dozens of different brands. Everything is where you would expect it to be with the left hand side of the screen used for displaying your cards and the right for having a chat with your bingo buddies. There are plenty of option to built in along with a good selection of mini games so there is no chance of you ever being bored. 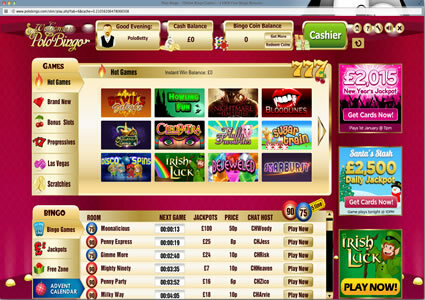 If you like big money games you are going to love the promotions at Polo Bingo. They have a schedule packed full of guaranteed jackpot games, so it does not matter if you play during the day whilst the kids are at school or late into the night after you have put them to bed, there will always be a big jackpot just around the corner. In addition to this they host special games seven nights a week for larger prize pots and even give you the opportunity to win up to £1 million once a month. In addition to this, there is plenty of free bingo to get your teeth into with some impressive prizes up for grabs. 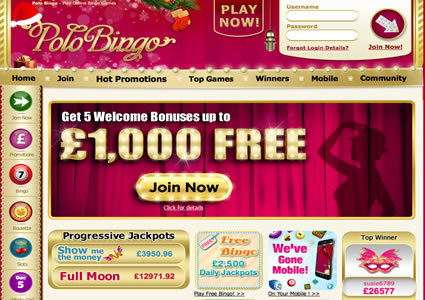 Polo Bingo is not a bad site at all as they have a great range of games and plenty of promotions to keep you occupied. Add to this the fact you can now enjoy all of your favourite games on your mobile phone or tablet device and you have a site that is showing they are here for the long haul and are planning for the future. The only downside to the site is the actual look of the place, the colour is off-putting, the design is dated and they are alienating all male players. If they gave themselves a bit of a makeover, they could easily gain an extra star rating! Polo Bingo is home to a great range of games including 75 ball bingo, 90 ball bingo and a wide range of exciting instant games. All of these games can be accessed from within the lobby which is well laid out and matches the designed of the rest of the site. Polo Bingo is powered by the 888/Globalcom software and is packed full of features including a selection of daub shapes and colours, best card sorting and a handy auto buy facility. You have a choice of chat rooms and you can alter the size and colour of your font to suit your own tastes. If you find everything is moving too fast and you are having problems keeping track of what is going on, you can lock it down and give yourself more time to read what is on screen. Other options in the chat room include a range of emoticons, quick access buttons for common bingo acronyms and the ability to send your friends virtual gifts. On the thirds Thursday of every month at 10pm, Polo Bingo gives you the chance to change your life forever with their ‘Self made Millionaire’ game. The prize pot starts at a whopping £1 million but slides as each ball is called until it reaches a guaranteed level of £1,000. When you register at Polo Bingo, you will get access to their ‘Free For Newbies’ room, where you can play a free bingo game every three minute for the chance to win £1 worth of bonus money. Once you have made a deposit of £10 or more though, you will also be granted three days access the ‘1st Deposit Room’ where you can win jackpots of up to £60. There is also a ‘Platinum Freebie’ room for VIP players with prize pots of £100 up for grabs. The freebies do not end there though, because every time you deposit £10 you will earn yourself three days access to the ‘3ree 4 Free Bingo’ room which you can find in the Free Zone tab in the lobby. There is only one game played in this room each day at 11pm, but it comes complete with a whopping £2,000 jackpot, meaning there is potentially £6,000 to be won over the space of the three days. In addition to this, you will also receive the ‘VIP – The Show Stopper’ newsletter, which will come straight to your inbox to let you know about any and all of their exclusive VIP promotions.